When we strip away the comparatives and superlatives and boil the quote down to its essence, we’re left with a simple message: There’s always room for improvement. This is just as true for pro basketball players sweating it out on the court as it is for content creators -- like me -- sweating it out in PowerPoint. As a content creator, it’s all too easy to get stuck in a “mediocrity loop.” Here’s what I mean: You create a SlideShare presentation (nice!). It performs well (cool!). So, when it comes time to create another SlideShare presentation, you simply follow the same exact formula you used to create the original presentation (makes sense to me!). After all, you know that this formula works and will net you a piece of “good” content. 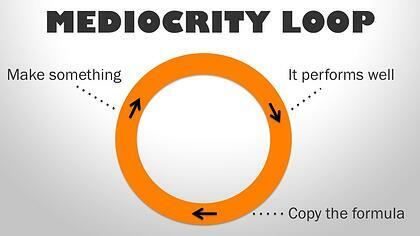 The problem here is that you’ve just become trapped in a mediocrity loop. Eventually, those “good” SlideShare presentations you churn out will grow stale, you’ll see diminishing returns on your efforts, and you’ll think to yourself, “What am I doing wrong?” The answer, of course, is that instead of continually looking for ways to make your content better, you decided to settle for good. And that’s bad! After reviewing your most recent presentation, ask yourself this question: “How could it be better?” Once you’ve identified where there’s room for improvement, incorporate your findings into your content creation process for next time. 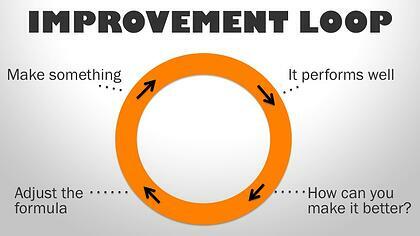 Now, your “mediocrity loop” has suddenly turned into an “improvement loop.” With each new SlideShare presentation you create, you'll be working toward achieving higher and higher quality. The tricky part here is identifying which aspects of your SlideShare presentations need improving. 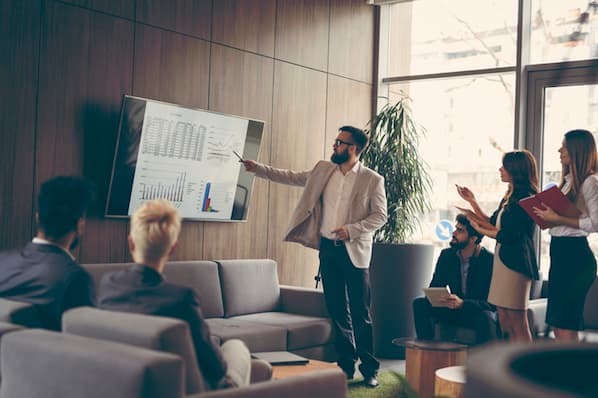 To the untrained eye, presentations can all seem the same: They’re just a bunch of text and imagery slapped onto slides, strung together to convey some type of message (right?). 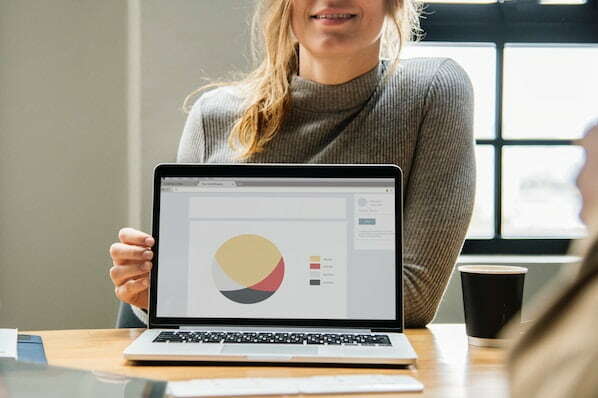 A closer examination of the most-viewed and -liked SlideShare presentations tells a different story: There are several best practices that can help you elevate your presentations from good to great. I’ve outlined seven of those best practices below. 1) Focus on font selection. Choosing the perfect fonts for a SlideShare presentation sounds like a pretty subjective process ... either you like a font or you don’t, and chances are, you’re going to choose the fonts that you like. 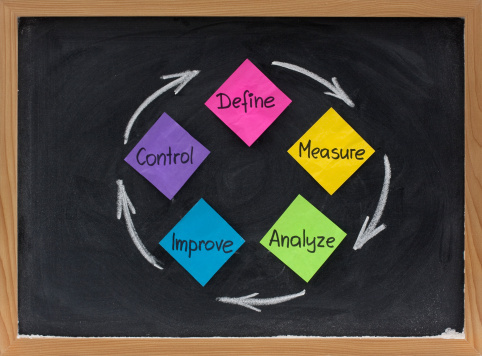 However, there is an objective side to this process that can help you improve the quality of your presentations. 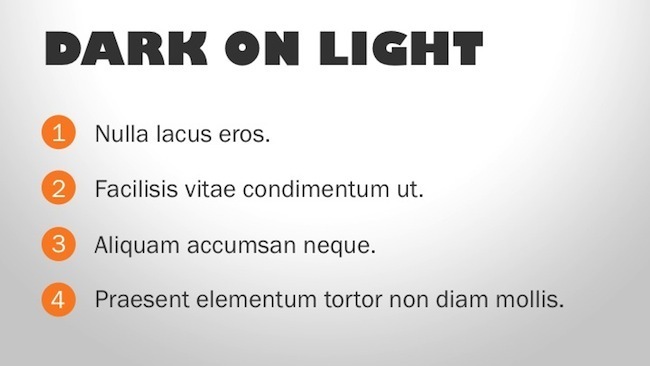 When crafting slides, you should 1) use a bold, stylized font for headers, and 2) use a simple, easy-to-read font for body text. The reasoning behind this approach is easy to grasp. Headers are meant to attract eyeballs -- thus, they need to be bigger, bolder, and have a little more pizazz than your body text. 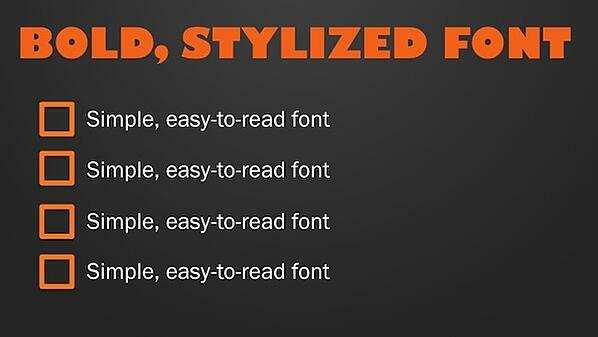 In contrast, the font you choose for the body text of your slides needs be optimized for legibility. While the header’s job is to grab a viewer’s attention and tee up the general theme of a slide, the body text is responsible for clearly conveying the “meat and bones” of a slide. Hence, the former can benefit from a stylized font, while the latter can benefit from a simple, easy-to-ready font. From a psychological perspective, certain colors are associated with certain feelings and emotions. For example, if you want to instill trust with your SlideShare presentation, blue is often touted as the best option. However, if you're trying to get people excited or to get them to feel passionate about something, red is typically regarded as the best choice. Keep in mind, however, that these color-emotion connections are not universal, as personal experiences and preferences can trump them. For a more in-depth look at the psychology of color in marketing, Help Scout has a great post on the subject. Psychology aside, it’s crucial that you think about contrast when choosing colors for your slides. Contrast refers to the difference between the lightest and darkest areas of an image. 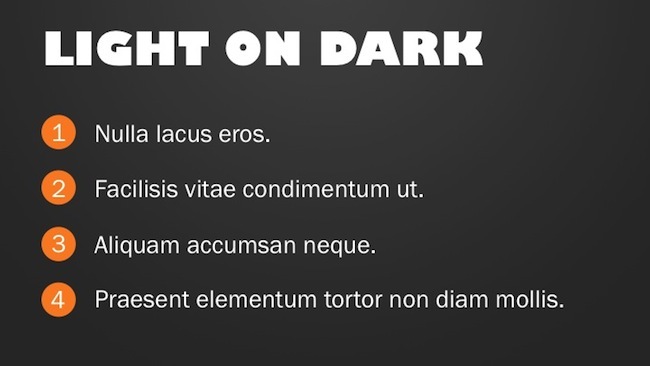 For the purposes of building a SlideShare presentation, think of contrast this way: Dark elements should always go on top of light elements and light elements should always go on top of dark elements. 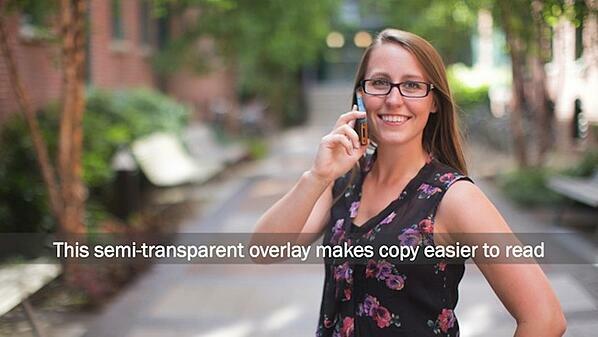 This ensures that all of the elements in your slides -- including copy -- will be easy to see. 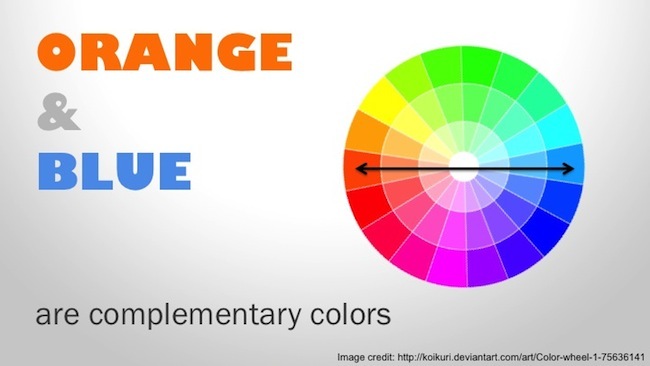 Another key point to consider when choosing colors for your SlideShare presentations is harmony. Here’s the deal: Certain color combinations are more pleasing to the eye than others, and this isn’t just a matter of personal preference. Color harmonies, or schemes, are based on the color wheel. 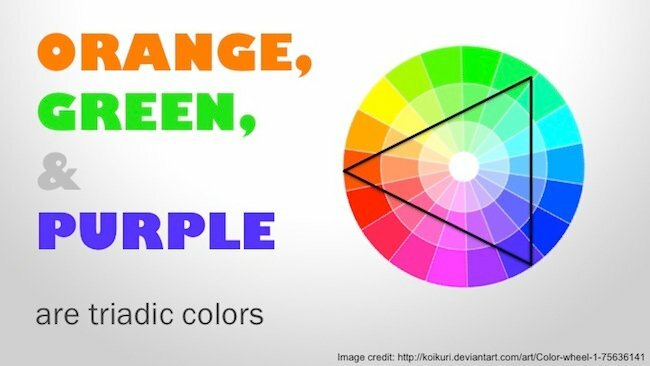 Two common types of color schemes include complementary (when two colors are directly opposite each other on the color wheel) and triadic (when three colors are 120 degrees from each other, forming an equilateral triangle on the color wheel). For a deeper dive into the wonderful world of color coordination, definitely check out this infographic from KISSmetrics. Awesome fonts, beautiful colors ... sounds like you’re on your way to creating some stellar-looking slides. The only thing missing? Amazing images. When you have a slide that’s slated to use a small amount of copy, try using a high-quality photo as the background instead of a color. A photograph can help you strengthen a slide's message and will also add some visual variety to your presentation. To ensure that your text is legible on top of the photo, simply use a semi-transparent overlay. This overlay will create some contrast for your text without completely blocking out the background photo. When presenting data in a slide, think about how you can use imagery to present that data in a more memorable way. The Official SlideShare Blog offers up a great example. 4) Supe up your title slide. Now that you understand how fonts, colors, and images can all help make a good SlideShare presentation even better, let’s apply those principles to your presentation’s most important slide: the title slide. Your title slide is your presentation’s headline. It’s the first thing your audience will see and it’s your only opportunity to hook them and get them to click through the rest of your presentation. So, how do you make your title slide as engaging as possible? Here’s a thought: use a visual metaphor. This can be achieved with a photo, vector graphics, or -- in the case of the SlideShare presentation below -- some well-thought-out spacing. It’s not colorful or flashy, and yet, this title slide does an excellent job of creating a visual metaphor that illustrates what the presentation is about. Oh, and did I mention that this SlideShare presentation has more than 2.5 million views and is the most-liked presentation of all time? A key takeaway here is that the visual in your title slide needs to actually tie in to what the rest of the presentation is about. 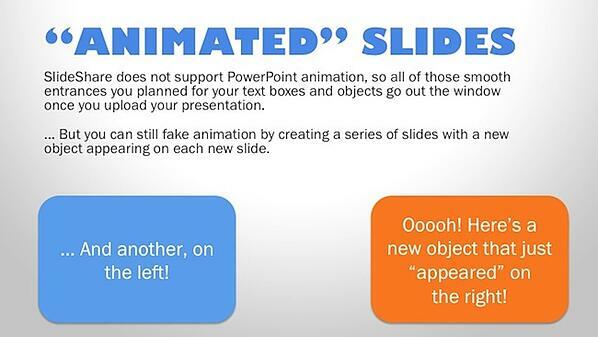 If you've ever delivered a live PowerPoint presentation, you may have had some fun with animations. Using PowerPoint animations, you can make copy, images, and other objects magically appear on a slide --- without having to skip to the next slide. This is a great way to bring in supporting points, arguments, etc. while still keeping your main message up on the screen. 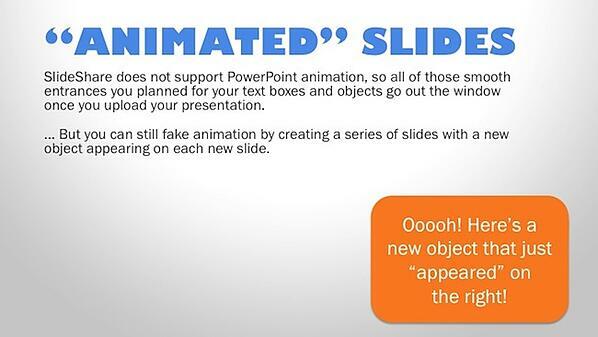 As you’ve probably noticed, PowerPoint animations don’t work in SlideShare (womp, womp). However, you can still replicate their magical, audience-captivating powers using a simple workaround. First, create a slide in PowerPoint, making sure to leave some empty space. Next, duplicate that slide and add in a new object (that’s why you needed some empty space in the original). Now, when you move from your original slide to the duplicate, it will seem like that new object is magically popping into existence. To continue the animation, simply make a duplicate of the duplicate and add in another new object. 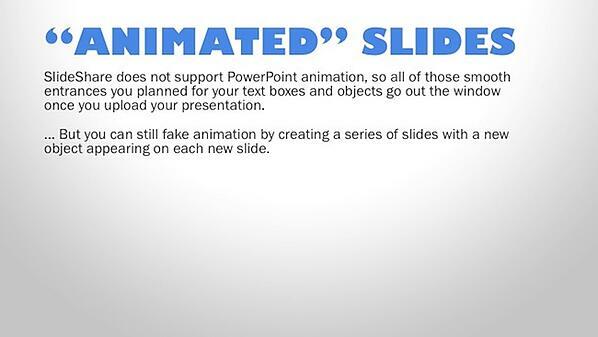 As viewers click through your finished SlideShare presentation, they’ll be “tricked” into thinking there’s animation. In reality, they'll just be seeing successive slides that incorporate new objects. Alright, I’ll admit it: Optimizing keywords won't make your SlideShare presentation look any better. However, it can help make your presentation easier to find. After all, what’s the point of putting in all that hard work to make a beautiful presentation if no one sees it? Let's imagine for a moment that you're creating that presentation about magical B2B lead gen tactics, which is loaded with amazing visuals of unicorns (prancing majestically, I assume). If you don't use the keyword "lead generation" anywhere in your presentation -- or in the settings when you upload your presentation -- you're making a huge mistake! Number four throw you off a bit? Here's the deal: SlideShare automatically transcribes the text in your slides and sticks it beneath your presentation on slideshare.net. And while you definitely, definitely shouldn't stuff keywords into your presentation (or any piece of content, for that matter), you should be aware that the copy you choose to include in your slides can affect how your presentation shows up in search. 7) Bring the story to life. When you present a PowerPoint presentation to a live audience, you have the benefit of being able to explain what is on each slide. You can also use slides to illustrate points or arguments that you are making verbally. You can’t do that with a SlideShare presentation. So, in lieu of you talking, you need to have your presentation do the talking for you. In other words, your presentation needs to tell a story. I purposefully saved this tip for last because it is one of the easiest to understand, yet -- at the same time -- one of the hardest to execute. Barry Feldman does an excellent job of explaining how you can use storytelling to engage your audience in a recent Inbound Hub guest post. By applying his storytelling principles to SlideShare presentations, we can come up with some solid takeaways that you can implement. First, you need to introduce the character(s) in your story. That could be you, your persona, or even your viewer, who you’ll be guiding through your story via your SlideShare presentation. The presentation below does an excellent job of establishing its protagonist, Dave. Once you’ve established who your character is, set the scene: Where is your character? What challenges are they facing? I've heard this introductory part of a story be referred to as “getting the cat stuck in the tree.” Once you’ve put the cat in this perilous situation, you can use the rest of your story to work out how you’ll get your furry feline friend down safely. Here’s a more practical example: You’re creating a SlideShare presentation about B2B lead gen. You can use the first few slides to introduce your character (Jim, the B2B marketer), you can use your next few slides to set the scene (Jim is having trouble generating leads), and then you can use the rest of your presentation to show how Jim solves his lead gen problem (using the awesome insight you provide). Of course, there are many great stories that stray from this cat-in-the-tree formula (pun totally intended). The important takeaway is that by giving your SlideShare presentation a clear, linear structure, you can help it unfold like a story, instead of having it seem like a collection of loosely related slides. 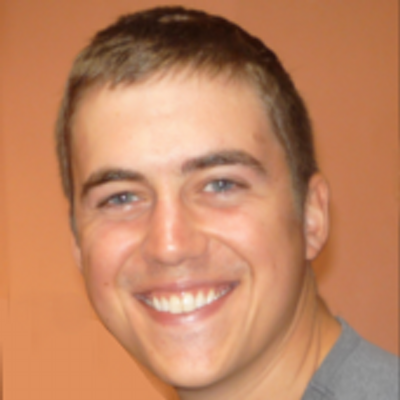 Know of other tips that can help make good SlideShare presentations even better? Share them in the comments section below!